Synopsis: War-weary, former military captain John Carter is inexplicably transported to Mars where he becomes reluctantly embroiled in a conflict of epic proportions amongst the inhabitants of the planet, including Tars Tarkas and the captivating Princess Dejah Thoris. In a world on the brink of collapse, Carter rediscovers his humanity when he realizes that the survival of Barsoom and its people rests in his hands. A few weeks ago, I reviewed Edgar Rice Burroughs’ sci-fi classic A Princess of Mars. After reading the book, I was excited to see John Carter, the movie based on A Princess of Mars, and curious to see how Disney would handle the violence, racism and sexism in the book. John Carter is a much more fleshed out version of A Princess of Mars. In the book, Carter can’t remember his childhood or much of his past. We also never get much of an explanation as to how he travels to Mars. In the movie, we see Carter as a broken confederate soldier who has lost his wife and child and just wants to move on with his life. We also see exactly how he is transported to Mars and it makes more sense than how the event was written in the book. Carter’s character is also much more likable in the movie. He is not egotistical or disparaging to the Native Americans and green Martians as he is in the book. Additionally, the back story about the death of his wife and child really humanizes him. Dejah Thoris’ character is also much more likable in the movie than the book. The big screen version of her is smart, a formidable fighter capable of defending herself and she does not use “female logic” to rationalize anything she does not understand. The movie does introduce the Therns, characters that were not in A Princess of Mars but are present in the next book in the series, The Gods of Mars. Since I haven’t read the second book, I’m not sure how accurately the Therns are portrayed. Another big difference in the book vs. the movie is Tar Tarkas’ role in his tribe and how his friendship with Carter develops. The book does a much better job of telling Tars Tarkas’ story and I am a bit disappointed that it was altered for the movie. Overall, I enjoyed this movie more than I thought I would. I would recommend it to sci-fi fans and especially to anyone who read Burroughs’ Barsoom series and ever imagined the book coming to life. So many things were exactly like how I pictured them, especially the green Martians and the airships. 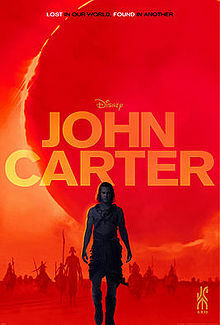 While this is a Disney movie and there were lots of little kids at the showing I attended, John Carter has tons of violence and while it’s not all gory, the body count is high. I would not recommend this movie for younger children. Glad this movie is good! I've wanted to watch it but haven't gotten to the theater in quite a while.